Rembrandt van Rijn is typically regarded as the greatest artist in the "Golden Age" of Holland and gained global recognition for his works. He was a painter, etcher and draftsman that lived from 1606 to 1669. Now the famed artist comes alive once again in his very own exciting 20-payline online slot machine in Rembrandt Riches! This fantastic game comes to us from IGT and High 5 Games and features some of the greatest features from the groups, to commemorate one of the greatest artists in history! Rembrandt van Rijn is typically regarded as the greatest artist in the “Golden Age” of Holland and gained global recognition for his works. He was a painter, etcher and draftsman that lived from 1606 to 1669. Now the famed artist comes alive once again in his very own exciting 20-payline online slot machine in Rembrandt Riches! This fantastic game comes to us from IGT and High 5 Games and features some of the greatest features from the groups, to commemorate one of the greatest artists in history! Go on the hunt to find some of Rembrandt’s most famous portraits (including self portraits) on the reels and when you do, the treasures that come with it are all yours. You’ll find an “RR” symbol on the reels, as well as three different portrait paintings, card symbols Q, K and A, and a Wild Symbol. Free Spins Bonus – Three scattered Bonus symbols on reels 1, 2 and 3 initiates the free spins bonus where you’ll win 6 free spins! Different reels are used during free spins so be sure to check the paytable for modifications to the payouts. If you get three more Bonus symbols on the reels during your free spins, you’ll earn additional free spins up to a maximum of 300 in total. Wilds – The Gold and Red “WILD” symbol is of course the wild and will replace all other symbols except the Scatter Bonus to complete winning combinations when possible. The Wild will appear on reels 2, 3 and 4 only. 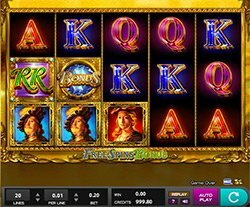 Tumbling Reels – All paytable defined symbol combinations trigger the Tumbling Reels feature during regular and bonus game play. All symbols in winning combinations disappear and replacement symbols tumble from above into their place to give you a chance at hitting new wins!